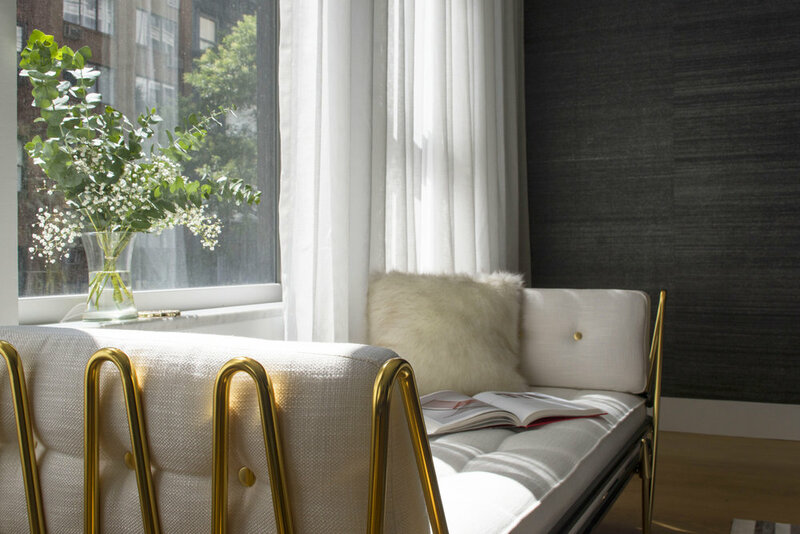 Masculinity meets livability in this upscale Flatiron, Manhattan bachelor pad. Decidedly rich in aesthetic, the textural palette of organic woods and furry hides soften the corresponding stainless steel accents, acrylic and lacquered pieces to create a youthful aura without sacrificing sophistication. Light oak plank flooring throughout gives way to Philip Jefferies dark charcoal grasscloth wallpaper, setting the stage for an array of gorgeous furnishings and eclectic artworks. In the living area, more contemporary angular architecture melds seamlessly with softer elements like a Roche Bobois curved sofa. A high gloss lacquer media unit by Roche Bobois adorns the space, accented by the acrylic armed side chair from Mitchell Gold + Bob Williams. In the master suite, subtle oranges, strong blues, and subdued grays offer a modern overtone in contrast to the classically chic Lizzoni leather upholstered headboard, plush animal hides and wood furnishings.